Aerial Yoga is a new type of Yoga that uses a fabric hammock as a tool to help students achieve the traditional Yoga positions. Aerial Yoga is uniquely developed for beginners through all levels of experience. No previous aerial, acrobatic, or Yoga experience is necessary. Aerial Yoga uses a circus hammock as a tool to help students achieve the traditional Yoga positions. Traditional Yoga positions lead us to a calm nervous system. At its core, the practice of Yoga is a process of calming our nervous system through stretches, deep breathing, and actively letting go of stressful thoughts so that we can stop seeing the world through fear, anger, sadness or desire. Since these emotions determine what attracts, distracts and repulses us, when they are no longer dominant in our minds coloring how we see the world, we are not as easily manipulated by advertising, political agendas, or people with ill intentions. This means we feel more in control of our everyday decisions and therefore our lives. Aerial Yoga uses the circus hammock to help students hold their bodies in the shape of traditional Yoga postures, the weight of the body being either partially or fully supported by the hammock. Many Unnata Aerial Yoga postures are designed to help the student better understand the purpose of traditional Yoga postures. Some Aerial Yoga postures are designed to help students achieve advanced traditional Yoga postures. Advanced Yoga postures can take years to learn, and even more time to understand and glean their benefits. The practice of Aerial Yoga is meant to help speed up that process in a safe manner. In an Aerial Yoga class, students use both the hammock and the floor to immediately feel the improvement in their flexibility, strength and alignment, and to understand how to use the skills and benefits achieved through using the hammock while attending non-aerial Yoga classes and other physical activities. The Aerial Yoga technique achieves more than a simple stretch. Our physical posture changes over time to increase our flexibility, develop strength, and forge deep, full breathing. Deep breathing reinforces a calm and serene attitude, which in turn increases our mental flexibility as well – the purpose of practicing Yoga. AntiGravity Yoga a hybrid combining traditional yoga poses with aerial arts, pilates and dance. This technique is the first in a new genre known as “suspension fitness”. The class emphasis is to have fun while learning new skills while experiencing a total body workout. Aerial Yoga class consists of floor work and aerial strengthening exercises, stretches and relaxation. The workout focuses around a low-lying soft fabric “trapeze” (called a “sling” or “hammock”) suspended from the ceiling to hip height. 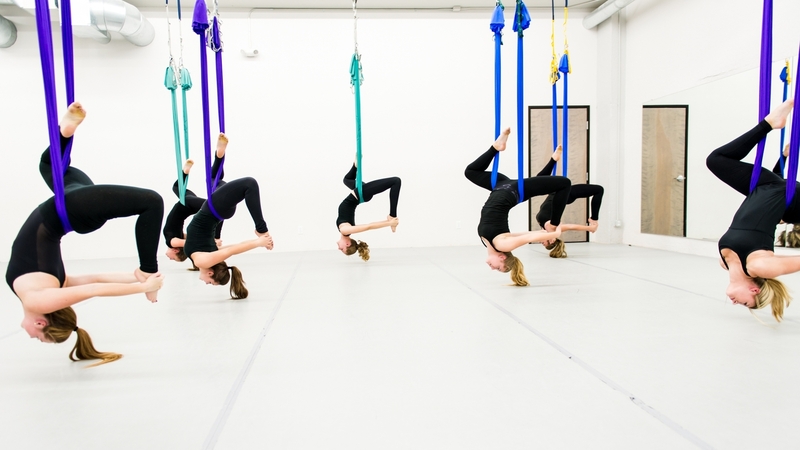 Aerial Yoga makes use of the fabric sling to distribute the body weight between the floor and the sling, allowing a variety of strength-building, balance awareness, flexibility and core strength moves. The sling assists in particular with challenging yoga poses, supporting the body’s weight during poses, allowing the body to lengthen as it holds a pose, allows the practitioner to focus on alignment and uses gravity to deepen the stretch. The sling supports the body during inverted poses, allowing the spine to lengthen as it bends resulting in reduced spinal compression in the pose. This decompression of the spine and joints leaves the body feeling taller. The class is designed for most levels of fitness, with modifications offered for different levels of strength and flexibility. This approach to fitness is what more and more women are taking up these days, as aerial yoga is literally lifting them off the floor of gyms and studios across the country. Recent interest has been touched off by professional acts like the Cirque du Soleil, but aerial dance has been around for hundreds of years; an aerialist is someone who performs moves from a joist that hoists them into the air. Aerial yoga is the latest spin on this older type of workout. While specific poses may vary from instructor to instructor, aerial yoga combines the basics of yoga with calisthenics, dance, Pilates and acrobatics. Developed by dancer/choreographer Christopher Harrison, this approach allows you to enjoy the more spiritual benefits of yoga along with the physical exercise, while having fun. In Aerial Yoga you’ll be suspended from the ceiling from silk fabrics tied together to create a “hammock.” The hammocks are hung at various heights, allowing you to try different types of yoga postures. The hammocks allow a greater range of motion and a deeper stretch than doing yoga on the floor. You’ll be trained in safety practices and get accustomed to hanging in the air. First on the agenda will be learning to become comfortable with a silk hammock that can actually support more than 1,000 pounds. Once you overcome your initial fear, you’ll practice simple moves such as sitting and holding onto the silks, followed by more advanced moves such as hanging upside down. “Safety is of the utmost importance when it comes to aerial yoga, so it’s crucial to seek out a qualified instructor who will take the time to carefully review how to properly get in and out of the silks, as well as how to make adjustments within the fabrics to ensure proper alignment and integrity within each pose,” says Jessica Matthews, MS, E-RYT. “It’s also important to ensure that the instructor is a registered yoga teacher who will be able to guide you through various physical postures while also offering modifications, progressions and/or alternate poses that best suit your ability level,” she says. The definition of yoga can be as wide or as narrow as you like. AntiGravity Yoga moves are derived from Pilates, dance, and calisthenics, in addition to yoga. What was missing from the class I tried was a focus on the breath, which is what some would argue makes yoga yoga. In this way, it was more like a fitness class. Now, I’m not someone who works out — I like my yoga. But I can see adding an AntiGravity class into my rotation because it has a reciprocal relationship with yoga. The strength and flexibility that you get from yoga help you do the AntiGravity poses, and, likewise, the AntiGravity poses offer a new way to cultivate strength and flexibility. It is usually advised that you practice yoga on a empty stomach, and that is especially true of AntiGravity Yoga, what with the inverting, spinning, and pressure of the hammock on your abdomen. Long pants and a shirt with sleeves are must-haves, since the hammock can dig into your arms and legs under the weight of your body. Those with certain medical conditions, such as glaucoma and high blood pressure, are advised not to undertake this practice, so be sure to check your medical history against this list. As with any yoga practice, coming prepared with a sense of humor and a willingness to try new things goes a long way toward making an AntiGravity Yoga class a fun and relaxed experience.